Ever hear of So-Lo-Mo, or social-local-mobile? If not, you will as it’s a growing trend and navigation company TomTom is embracing it. 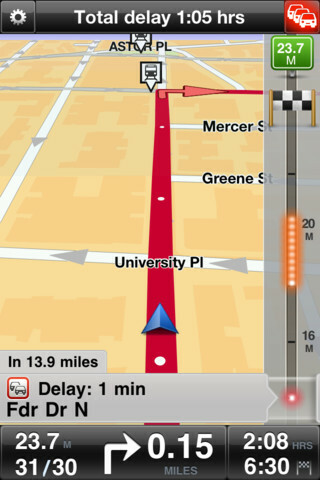 The company released a new version of its TomTom App for iPhone on Tuesday that includes full Foursquare support. This follows the prior app update, which added Facebook Places(s fb) for search and check-in functionality. Find millions of exciting places to visit by searching with Foursquare, even if you are not a Foursquare user. Log into Foursquare and you can also check in at your destination so you don’t miss any points on your way to becoming its new mayor. The same holds true for the Facebook Places integration from the last software update, making it easier and faster to find locations that friends have recommended. Given that GPS-enabled smartphones and navigation software have provided a lower-cost option than single-purpose navigation devices, this is a smart move by TomTom. Adding both search and check-in features for Foursquare and Facebook adds value to users of both social networking services, allowing companies such as TomTom to not be shut out of revenues by Google Maps(s goog) and other mobile apps that replace standalone GPS navigation devices. This So-Lo-Mo trend is a concept we’ll be talking about in more detail next month at our Mobilize 2012 event in San Francisco. In particular, we’ll be chatting with Zillow CEO Spencer Rascoff to better understand how the traditional location-based real estate market is moving towards a mobile-friendly environment with social networking opportunities. I want Google to be the default search option but cannot change it from Facebook which adds ZERO value for me. Even better would be an app that’d send my iPhone GSP data to my GPS-less iPad.